This luxury, light filled home is situated at an elevation of 4200’ on a beautiful wooded hillside overlooking Shortoff Mountain. 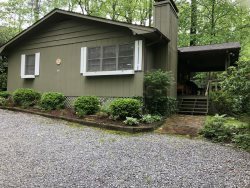 Conveniently located 7 minutes to Main Street Highlands, 10 minutes to Cashiers. ~ Wildwood Forest community is a fairytale mountain community like no other in Highlands. A truly magical cottage, this is why you come to Highlands. ~ Private community pond & gazebo by trickling mountain creek for intimate picnics. ~ Home is filled with fine original art, leather furniture, antler chandelier and lamps, antiques and rugs from around the world. Authentic Native American Indian trading blankets to snuggle up in on chilly nights. ~ Custom ironwork throughout home by Whitney Butler Designs of Pensacola. ~ Professionally decorated & appointed by Stan Cox Interior Design, Knoxville, TN. ~ Three deck areas: open deck with seating for 4, covered porch deck with dining for 8 with gas grill and outdoor woodburning fireplace, Spa deck with 6 person spa. Flame azaleas and rhododendrons abound. Private deck off downstairs master. ~ 27’ beamed vaulted great room with stone wood burning fireplace with floor to ceiling windows, hardwood floors, fabulous mountain views. ~ Downstairs queen bedroom with custom iron and pecan bed and charming period antiques. ~ Fabulous loft area with fanciful artistic sofa and game table for relaxing evenings with beautiful sunset views of mountains. ~ Upstairs king master bedroom, large walk in closet and private bath. soaring cathedral wood and beamed ceiling. ~ Wireless internet, three large flat screen TV’s with cable & premium channels, DVD players, games and books. ~ Level entry level while living in treetops from decks. ~ We are sorry, but we cannot allow pets due to allergies, please do not bring them, thank you.